Personalized training sessions under the guidance of a physical therapist will provide you with one of the most sustainable methods of achieving your goals. Your Studio U experience begins with a review of your current needs and future goals. A physical therapist will evaluate your strength, flexibility, posture and muscular balance. Then, personalized sessions will incorporate physical therapy, Pilates and personal training to help you reach your goals. Studio U bills as an out-of-network provider, unfortunately we can not accept Medicare. 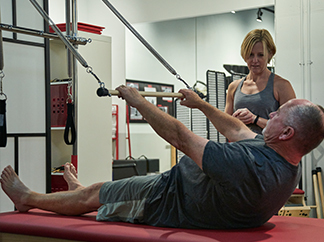 Individual sessions with a physical therapist or a pilates instructor will improve your strength and body tone, increase your sports performance, rehabilitate injuries, or simply help you look and feel your best. Instruction goes beyond a training class but how to extend new strengths and habits. Sessions never become routine as they are continually modified to maximize your ongoing personal development. 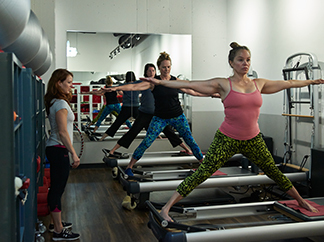 Studio U delivers a truly boutique approach to fitness. Small group classes (usually limited to three participants) allow instructors to customize training to meet individual needs and goals. Personal training will provide you with a customized program designed to help you achieve your fitness and wellness goals. Our certified, experienced trainers assist with exercise prescription and instruction to create a challenging, safe, results-oriented workout specific to you. 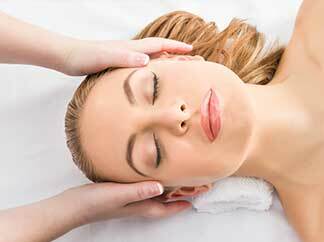 Sixty-minute table massage sessions at Studio U can cover the full body or focus on specific areas. Your massage therapist will work within your comfort zone, incorporating relaxing Swedish techniques and deep tissues techniques based on your preferences. Table massage may be completed against the skin or over light clothing.